Cheater Plugs give you the look of gauged ears without having to actually stretch your ears! 316L SURGICAL STEEL PLAIN CHEATER PLUGS. 0G LOOK,ALTHOUGH THEY ALL JUST HAVE A THIN 16 GAUGE BAR,THAT ANYONE WITH A REGULAR PIERCED EAR CAN WEAR! 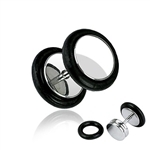 TOP QUALITY 316L SURGICAL STEEL,FOOL EVERYONE WITH THESE AUTHENTIC LOOKING PLUGS! each sold separately (order 2 for a pair) GLOW IN THE DARK CHEATER TAPERS IN GLOW COLORS SHOWN BELOW.THESE REALLY DO GLOW IN THE DARK! THESE CAN BE WORN BY ANYONE WITH A "REGULAR" PIERCED EAR,YET GIVE THE ILLUSION THAT YOU ARE WEARING A 0 GAUGE TAPER,NO STRETCHING NEEDED! TOP QUALITY 316L SURGICAL STEEL. Hand Carved out of Buffalo Horn. Small enough to fit a normal piercing. 14GA UV Black Faux Plug w/Logos CHEATER MARBLE SWIRL U.V.TAPERS IN A "0 GAUGE LOOK" WITH A THIN 16G SHAFT.THESE CAN BE WORN BY ANYONE WITH A REGULAR PIERCED EAR YET GIVES THE LOOK OF A OG STRETCHED EAR.TOP QUALITY 316L SURGICAL STEEL SHAFT.COMES IN COLORS SHOWN BELOW.316L SURGICAL STEEL 16G. each sold individually (order 2 for a pair) NEON CHEATER TAPERS IN NEON COLORS SHOWN BELOW.EACH TAPER COMES WITH 2 BLACK "O" RINGS ON IT TO MAKE IT LOOK 100% AUTHENTIC AS IF YOU REALLY STRETCHED YOUR EARS TO A 0 GAUGE! 316L SURGICAL STEEL 16 GAUGE THIN BAR CAN BE WORN BY ANYONE WITH REGULAR PIERCED EARS,NO STRETCHING NEEDED! RASTA STRIPE CHEATER PLUGS IN SIZES SHOWN BELOW.THESE PLUGS CAN BE WORN BY ANYONE WITH REGULAR PIERCED EARS YET GIVES THE LOOK THAT YOU HAVE STRETCHED YOUR EARS.FOOL YOUR FRIENDS WITH THESE HOT SELLING RASTA CHEATER PLUGS.TOP QUALITY 316L SURGICAL STEEL 16G THIN BAR SHAFT. each sold separately (order 2 for a pair) CHEATER TRIBAL ACRYLIC TAPERS WITH THIN 16 GAUGE 316L SURGICAL STEEL SHAFT.COMES IN SNAKES,DRAGONS,SKULLS AND MORE.TOP QUALITY 316L SURGICAL STEEL SHAFT 16 GAUGE. THESE TRIBAL DESIGN CHEATER TAPERS LOOK VERY COOL IN THE EARS AND THEY ARE VERY DURABLE WITH THE STEEL BAR WITH BALL ON THE END,JUST SCREW THE BALL OFF AND INSERT IN YOUR EAR AND SCREW THE BALL BACK ON,VERY SIMPLE AND COMFORTABLE! each sold individually Spotted Horn Piercing. Hand Carved out of Buffalo Horn and Bone. Small enough to fit a normal piercing. U.V. CHEATER PLUGS.TOP QUALITY U.V. REACTIVE.16 GAUGE THIN BAR WITH A 0 GAUGE LOOK.TOP QUALITY 316L SURGICAL STEEL. each sold individually U.V. CHEATER PLUGS 100 PACK. 50 ASSORTED PAIRS OF OUR BEST SELLING STYLES. TOP QUALITY U.V. REACTIVE.16 GAUGE THIN BAR WITH A 0 GAUGE LOOK.TOP QUALITY 316L SURGICAL STEEL.